In translation as in life, there are bullies and pushovers, and then there are those who understand that respect is a mutual thing and the only way to win, whichever side you’re on. The second scenario is a no-brainer to me, yet there is no shortage of candidates for the former. As any successful freelancer out there knows, the ability to say “no” to some offers is a must if we are to survive. Having been a translator for over 8 years now, I have seen several colleagues start their career, then stop. After a few years of working long hours and weekends, under the constant pressure of tight deadlines for pitiful rates, with no savings for even a short holiday and no thanks from clients for sacrificing their quality of life, with the feeling of worthlessness that comes with it all, it comes as no surprise that these translators have given up. While I appreciate how some may fall into the trap of believing that “it’s that or nothing” (a typical bargain hunter’s manipulative tactic), becoming such a slave is a choice (albeit a subconscious one) as much as being a shark is a choice (albeit not such a subconscious one). When a translator refuses to work for a rate that they consider too low, they are not being greedy or stubborn: they are simply asking for recognition of their skills and worth in the form of a sustainable rate. In the early days of a career when work is slow to come, it certainly is a nerve-racking stance, but I can say now that it pays off in the long run – and surely a long run is any business’ goal, be it a translator’s or a client’s business. Supporting one another is what enables us all to thrive. 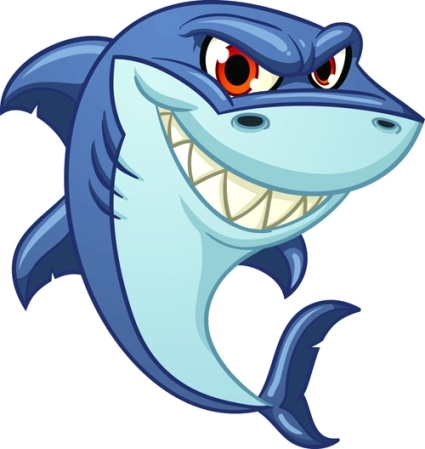 Sharky clients shoot themselves in the foot until no one is willing to work for them (a common occurrence amongst translation agencies). The rates that clients pay are a reflection of their respect for translators, and no one should ever have to argue for respect. Well done! This post will be sent by me to a few places, like LinkedIn and a translators’ email list. I hope it gets plenty of readers! !